"Men have had every advantage of us in telling their own story. Education has been theirs in so much higher a degree; the pen has been in their hands." These words were written by Jane Austen 200 years ago, spoken by Anne Elliot, the heroine of Persuasion, but they're just as true today. OK maybe we've evened things out a little bit in the last 200 years, but women's stories told by women are still in the minority. Fortunately, Jane Austen was able to tell her story despite the obstacles, a story of strong women who are determined to decide their own fate despite living within the confines of early 19th Century English society. 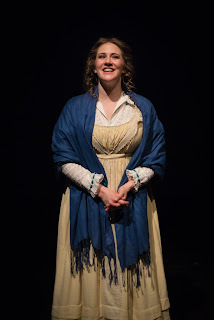 One of the less common iterations of this story, her final novel Persuasion, has received a new adaptation by local theater artist Kayla Hambek for Aethem Theatre Company, and it's just delightful. Full of the Jane Austen charm, the familiar story of a strong, determined, principled woman who won't settle for less than her heart's desire, brought to life by a large wonderful cast with creative use of movement to convey emotions - it's a must-see for Janeites. 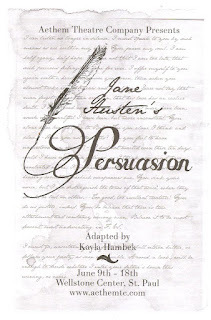 I've never read Persuasion nor seen any adaptation of it, but the story is still familiar to me. A young woman finds her fortunes declining, must deal with annoying relations, while there is an impediment to her marrying the man that she loves (whether internal or external), and a charming red herring of a man turns out to be unworthy. In this case, Anne is the ripe old age of 27, and she once almost married the man she loves, a Captain Wentworth. But her father, older sister, and dear friend of her deceased mother persuaded her that he was beneath her in stature. Now, eight years later, they meet again. Fortunes have reversed - he's a successful captain and her family has been forced to vacate their home for a smaller, more affordable place. They both still love the other, but pride or prejudice, sense or sensibility, get in the way. Of course they do eventually admit their love for each other, but watching the unsmooth course of their true love makes the eventual reunion that much sweeter. The story is framed as a series of letters from Anne to her deceased mother. Having never read the book, I'm not sure if this is how the book is written, or if it's an addition by the playwright. Either way, it works wonderfully well and allows us to quickly get to know Anne's deepest thoughts and feelings. Another way into Anne's thoughts and feelings is through dreamlike movement, when Anne imagines what it's like to meet Captain Wentworth again, or be rejected by him, or accepted by him. The reveal of Wentworth's feelings is particularly beautifully done, an emotional and evocative dance with the words of his confession letter as voiceover. The movement and music works so well that I wish there were more of it. The frequent scene transitions are at times a bit clunky and often consist of: lights down - move furniture in dark silence - lights up. I would love to see some of the creativity of movement and music used within the scenes applied to the transitions to make the story flow more smoothly. Audrey Johnson gives a wonderfully warm and fully realized performance as Anne. She rarely leaves the stage and delivers many monologues that begin with "Dearest Mama" and end with "Love, Anne." And every time she says the words "Love, Anne" (which is a lot) they mean something different. With just those two words Audrey conveys exactly what Anne is feeling at the moment - joy, confusion, excitement, resignation, uncertainty, despair, hope. A super-cut of every time she says "Love, Anne" would contain the entire arc of the character. Most of the ensemble members play two characters in this complicated story with many interrelated characters, and it's a credit to the adaptation and direction (by Calli Kunz) that it's never confusing. Everyone in the cast is quite capable and mostly spot-on in the English accents (dialect coach Jamie Jachimiec, who also plays two polar opposite roles). The only ensemble member I feel compelled to call out individually is Kayla Dvorak Feld, who's a hoot as Anne's younger sister Mary, a selfish, self-centered, high maintenance hypochondriac who wholeheartedly believes she's the best person in the room. 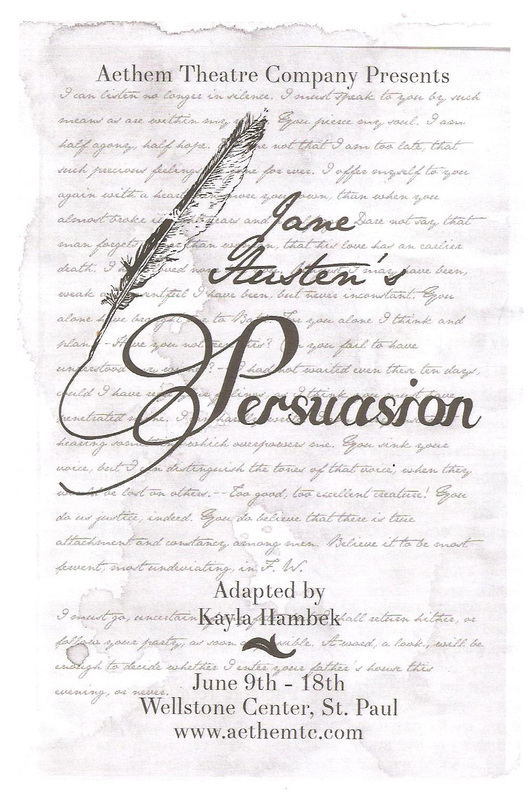 Persuasion plays out on a mostly bare stage, allowing the setting to be in the imagination of the audience, which is easy to do thanks to Jane Austen's words. 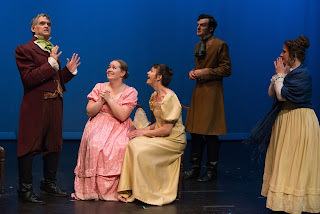 The ensemble, dressed in period costumes, moves freely around the stage, including through the audience of the auditorium theater at the Wellstone Center in West St. Paul. The delightfully charming Persuasion continues through June 18th. At a ticket price of just $18, it's a great opportunity to enjoy one of Jane Austen's lesser known works onstage and sample the work of the talented young theater artists at Aethem Thetare Company.